As a savvy business person, you are always looking for cost-effective ways to grow your business. According to research from the go-to source for marketing statics, the Data & Marketing Association, direct mail has the highest response rate by far when compared to email, paid search, online display ads and social media. In addition to having the highest response rate, direct mail, especially shared mail, also has the benefit of being cost-effective which delivers a positive return on investment for your direct mail advertising campaigns. Here is an example of the ROI generated from a campaign that we developed for one of our customers: a residential and commercial paving company needed a marketing plan that would increase sales and grow their customer base. After one mailing utilizing our Impact Postcard, they received $36,000 in sales revenue and $31,086 in ROI! Want to see more results across various industries? Check out our customer success stories section to see more great results like this one. How Does Direct Mail Grow My Business? Now that you know why you want to use direct mail to promote your business, let’s talk about how it can grow your business. We start by identifying the right consumer for your message. We do this one of two ways, by using either predictive data or client-provided data. For either path, we start with gaining a basic understanding of what your desired customers are like. Then, we gather predictive data from various sources that combine demographics, geography, consumer expenditure information, consumer behavior data, and consumer brand preferences. All of this data not only helps us find the best households for your message, but it also allows us to help you craft a persuasive message that resonates with your audience. The other type of data we can utilize is customer data. If you have a customer database, then we can further refine your mailing profile by adding it to the predictive data. If you do not have any prior customer data, don’t worry. We can create a highly targeted mailing profile for your business utilizing predictive data only. Once we understand who is your best customer, we can create a customized mailing profile that will visually pinpoint your best customers, prospects and lookalikes (people who share common traits with your best customers). After defining the who, what, and where, we now have enough information to create a customized marketing plan for your business. We combine your business needs with your carefully crafted mailing profile that targets the right customers, and select the most effective type of shared direct mail piece for your message. It’s a one-two punch that delivers a positive return on your advertising investment. 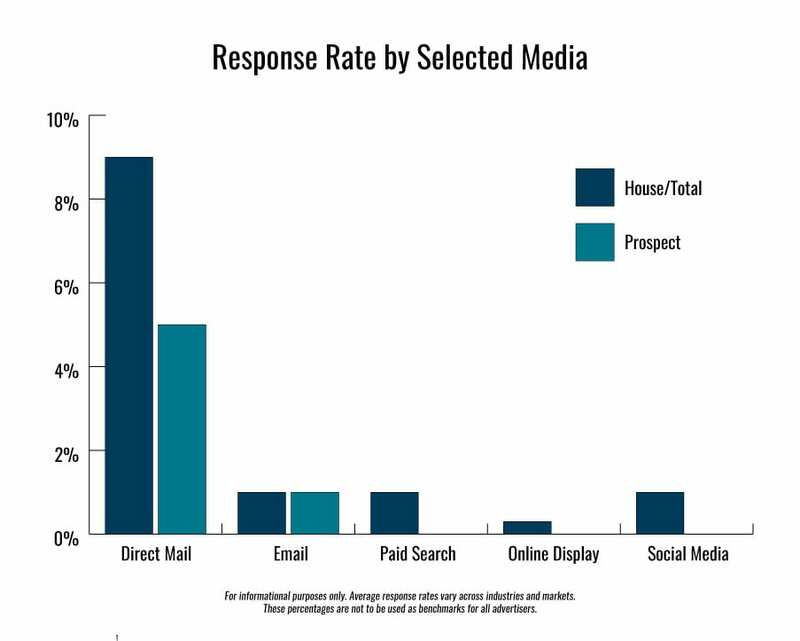 Direct mail has a distinct advantage over all the other advertising mediums mentioned in the chart above. It gives you the ability to create one-on-one messages in a tangible format. The combination of precise customer targeting and a tangible printed piece keep your message in front of your customer and serve as a reminder of the action you want them to take. Think about it… what would you remember more? An email that you received several days ago that is buried in your inbox with thousands of other messages, or a printed piece that you can sit out on your kitchen counter or put in your car to remind you to make a purchase? What Types of Messages Will Grow My Business? The type of message you will utilize to grow your business will depend on your goals. Our direct mail consultants (a.k.a. 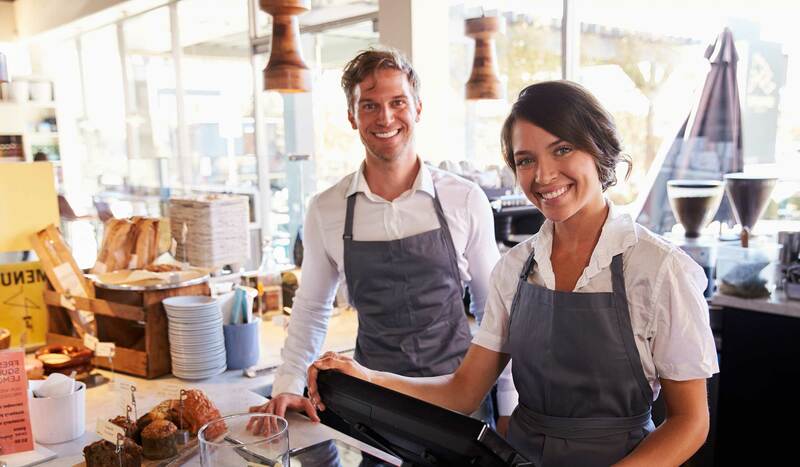 account executives and directors) will work with you to help develop a customized direct mail marketing plan based on your individual business needs and goals. Because of direct mail’s precise targeting capabilities, you can send your message only to the households most relevant to your location. If you have customer data, you can further refine your message to target specific households in a geography. For a more in-depth look at this type of message, please have a look at our blog post, “How to Promote Your Grand Opening with Direct Mail”. Direct mail is a great way to convey your message about a new product or service. Due to the static nature of a printed advertisement that is delivered directly to the mailbox, you have the opportunity to provide all the details about your offering to customers. There are many piece sizes to choose from, so you are not limited by space constraints. Also, by targeting your new product or service to your best possible customers, direct mail will decrease the wasteful spending that comes with other forms of advertising and save you money. Are you looking to promote a specific service or product? Direct mail has the capability to deliver individualized messages in one mailing with our Impact Postcard. This flexibility allows you to target each household with a specific product or service and unique offer in a single mailing. The ability to target where this message is delivered allows you to reach the right audience for new lead generation. What do we mean by education? You can use direct mail to educate a person about how your service works, what types of guarantees you offer, who to contact if they have questions, and much more. For products, you could explain how it will help a person accomplish a task, help them relax, improve their health, save them money, etc. The reason direct mail is a great choice for education is that you are not limited to a certain amount of characters like social media. Also, you can go into much greater detail than with online search and display ads. If you have a current customer list, you have a great opportunity to build brand loyalty with direct mail. A customer list that contains personal information and purchase history gives you an easy way to develop highly customized messages. These messages will show your customers that you care about providing them with the right offers for the right products.